DRAW REVIEW: The reigning Women's Challenge Cup winners from Croatia were among the teams drawn in the big European Cups draw on Tuesday. The defending champions of the Women's Challenge Cup HC Lokomotiva Zagreb will open their title defence in the new season in Round 3 against the winner of the Round 2 match between HC Olimpus-85 SSSH-2 from Moldova and the European Cups newcoomers UHC Müllner Bau Stockerau from Austria. 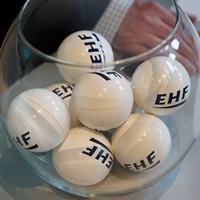 The draw at the EHF Office in Vienna contucted by the Austrian Handball Federation Secretary General Bernd Rabenseifner together with Markus Glaser, EHF Chief SPorts Officer, determined all pairings for the first two playing rounds - Round 2 and Round 3. The first Round 2 leg is scheduled for 14/15 October, while the second leg will follow one week later. Lokomotiva will return into action only in the first leg of Round 3 11/12 November and the second leg will be played on 18/19 November. The 2016 Challenge Cup winners Spain's Rocasa Gran Canaria will face Maedilon/VZV from the Netherlands in Round 3, while the 2007 trophy holders ZRK Naisa Nis from Serbia will take on Maccabi Arazim Ramat gan from Israel.